Off-trail, I like numbers and charts. 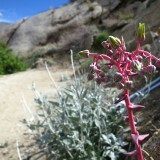 On-trail, I feel no differently. 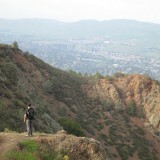 Quantifying aspects of my hikes made them feel more manageable to me, and thus more doable. It’s an illusion of control, to be sure, but one I find useful. While I was hiking the Pacific Crest Trail last summer, I recorded where I slept each night in a paper journal. I filled up two Moleskines with mileage, campsites, stories, and stray feathers, and now I’ve pulled out that data and combed through it to give me a big-picture look at my PCT mileage over the entire course of the hike1. 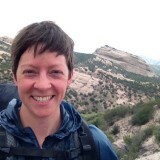 Turns out, of my 160 day (159 night) trip, I slept 50 nights in towns or with trail angels, not on the trail. 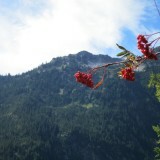 I hiked 15% further on days when I was entirely on trail (neither leaving nor arriving in a town). 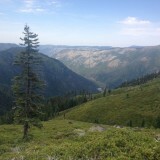 Of the nights I spent camped alone on the trail, 81% were before seeing that first cougar while night hiking. I thought some of you might find these stats interesting too, so I’m sharing them with you today. Let’s start with straight-up mileage. I recorded where I slept each night, so I was able to get a picture of how far I went each and every day. This first chart shows my hiking mileage across my entire PCT hike. Hover over a day to see mileage for that day. You can use the tabs in the upper left to zoom in to a closer view of 3 months, 1 month, or 5 days. The overall picture is all well and good, but it doesn’t tell me much about my average day. How often did I go a particular distance? Did I hike mostly 20s? 25s? 15s? 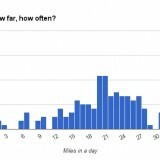 I charted the frequency of different daily mileages to answer this question. 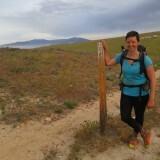 I most commonly hiked 19 or 20 miles per day, and somehow managed to never hike a 29 mile day. Of the 22 zeros, all were in town, none on trail. 5 (and 1 nero) were due to getting off trail for a family illness. All-on-trail average (mean): 22.2 miles/day. All-on-trail means I didn’t leave, arrive at, or pass through a town. Eagle eyes will notice that the mileage I hiked doesn’t match the official total. I trail and road-walked around the Mountain Fire, Powerhouse Fire, and Endangered Species closures in southern California, and took a few ~10 mile shortcuts (Oregon Skyline Trail in OR and Goldmyer Hot Springs Alternate in WA). Though I had 22 zero days entirely in town, I passed through towns2 on far more days. In fact, I passed through towns on more days than not. More of the 160 days I spent on the PCT saw me arriving in, departing from, staying in, or passing through towns, than days that were 100% on trail. Not what I would have expected out of a long distance hiking trail. I will say, though, that I didn’t mind it terribly. While I preferred the wilderness sections of the PCT, I appreciated being able to carry less food in the areas with frequent roads, and I certainly could have chosen to stop in fewer towns. I was able to tell from my journal where I had slept each night, and looking at the overall results surprised me a bit. Because I sometimes slept in town without staying a whole day there, the number of nights I slept in town is almost twice as high as the number of zero days I took (22). Though I appreciate the hospitality and generosity of trail angels, I usually preferred the simple business transaction of paying money for a bed in a motel to the social obligations of staying with people, hence the low number of nights with trail angels. Campground here means a camping area with some sort of toilet facility, usually for car camping. These were surprisingly frequent along the trail, particularly in SoCal, but also as far north as Rainy Pass and Hart’s Pass in Northern Washington. Because I started the hike solo, and didn’t join a hiking group until Oregon, I had this idea that I spent most nights alone, at least before my NorCal animal encounters. Turns out, that wasn’t actually the case. For this chart, I’m only looking at the 109 nights I spent on the trail (including campgrounds), since I was never scared or lonely in a town — except for the dead-animal-smelling room in Chester, CA. That was a super sketch. Here, 10 means 10 or more. It’s interested to me to see that almost half of my nights on the trail were solo or with one other person. After the bear and the cougar, I was terrified to have another animal encounter on my own, and though I loved the control over my experience that hiking solo gave me, it didn’t feel worth the debilitating fear of the nights. I gave in to this fear for hundreds of miles, and it was only in mid-Washington that my need for solitude and to hike my own hike lead me to start overcoming this conditioning. Though I loved the freedom of camping alone, some of my favorite nights on the trail were with one or two other hikers. It was lovely to get to make camp and unwind with other hikers, compare notes about the scenery we walked through, share aches and pains and tiny bottles of rum. Unplanned zeros: all of them, I was terrible at planning where I was going to be when. To get these numbers, I logged all of my mileage data into a spreadsheet using Google Sheets, then exported it as a CSV. I uploaded that to Mode Analytics and used their free service to run SQL queries over my data. I make zero claims to statistical significance about any of these numbers. I rounded to whole numbers when I felt like it. All the charts are made with Google Sheets as well. 2I counted as a town any place I could get a resupply package or purchase supplies. This includes lake resorts like Vermillion Valley Resort (VVR), Shelter Cove, Olallie Lake, Elk Lake, and Stehekin. So Comprehensive! Some would say too much so! Anyways, good entry as always! Yeah, I know you have the same info. I didn’t even have to record most of what I coded — I was able to recall if I went to a town or not or what the campsite was like based on what I put in my journal. That being said, my journals have NOTHING on Kolby’s — mad props to him. Data gives the shape of a thing, same as paint on a canvas or a musical score on a page. These AARs (after-action-reports) are not *too* comprehensive and they give form to things which taken discretely are fleeting and trivial but have greater meaning taken together. I love the detail on “alice hikes.” I never took the time to interpret what happened on a hike or a ride afterwards—only as early as a teenager (and still, today), I began to plan the heck out of whatever undertaking contemplated *beforehand,* with notes on every aspect, references to others’ experience, predictions of how something would be handled best. And I also turned out to be terrible at planning where I was gonna be when. Mostly the prepared notes just helped me learn about where I was headed and I often ended-up brute-forcing my way through understanding it once I got there. Everybody hikes their own hike; this kind of writing is as close as I’m ever gonna get to a thru-hike of the PCT. Thank you. I definitely find the after-the-fact analyzing more manageable than before the trip planning, at this point in my adventuring career. Let me know if you’d ever like me to crunch your bike data. wow! I did CA in 85 and OR/WA in 87. I have all this data from our trip journals but wow! hard to fathom it now but then? congrats on all the crunching. I plan to rehike during this 30 year anniversary and further compare. How exciting to get to walk the same trail twice, separated by 30 years. That sounds like a wonderful trip – best to you on all your planning! I’d love to hear how it goes. Hi there, Do you still monitor this? i have a couple questions for you if you do. Such great data. These statistics are AWESOME! 138 Snicker’s Bars! I love it! 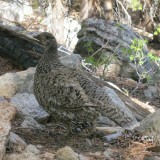 Can you tell me about what dates you were in the Sierra Nevada, around and north of Lake Tahoe? Some friends and I want to hike in and be “Trail Angels” for a day, bringing water, food & goodies to Thru-Hikers.